Rushing: Missouri, Drain 20-93, Vernon Boyd 6-29. Nebraska, DuBose 23-162, Smith 8-52. Passing: Missouri, Seitz 5-10-2-71, Adler 2-6-0-27. Receiving: Missouri, George Shorthose 3-60, Adrian McBride 2-29. Nebraska, Todd Frain 2-34, Smith 1-30. Missed field goals: Nebraska, Klein 43. Nebraska got three big plays in the middle part of the game to get some breathing room and went on to record a 33-23 win over Missouri in a typical, hard-hitting Husker-Tiger game. 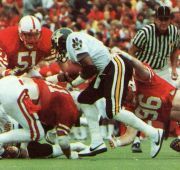 Middle guard Ken Graeber broke a 7-7 tie when he tackled Mizzou quarterback Marlon Adler for a safety, then I-back Doug DuBose gave NU a 16-7 lead on the next scrimmage play with a 48-yard touchdown run. The Tigers pulled within 16-10 at halftime and were threatening again early in the second half when linebacker Marc Munford picked off a Warren Seitz pass and scored on a 57-yard return to give Nebraska a 23-10 lead which the Tigers couldn't overcome.